FRED PHILLIPS WORMELLE and PETER MAREB, TRUSTEES of the J. P. REALTY TRUST vs. JOHN TAYLOR and MELINDA C. TAYLOR, ALBERT W. KOCH and MARJORIE C. KOCH. In January 1982, the plaintiffs brought this action under the provisions of G.L. c. 240, §6 to clear title to a certain parcel of land in Falmouth as shown on a plan recorded in Barnstable County Registry of Deeds in Plan Book 274, Page 38 (Exhibit 13) [Note 1] by a determination that the defendants have no easement over the plaintiffs' land. The plaintiffs originally named numerous defendants in this action, however, all but those named above have denied any claim of easement and such defendants were dismissed. The defendants, John Taylor and Melinda C. Taylor, did not appear at the trial and were defaulted. The plaintiffs have suggested that inasmuch as the remaining defendants, Albert W. Koch and Marjorie C. Koch, are lessees and not fee owners, they are not proper parties to claim the easement. Because of the conclusions reached below, I do not decide this question. This cause came on to be heard on May 26, 1987 and was argued by counsel, Eighteen exhibits were introduced and one witness was called. These exhibits are incorporated herein for the purposes of any appeal. 1. Sometime in April 1958, Bruce E. Barnard became the owner of a parcel of land described in a deed recorded in Book 1001, Page 331, said property being shown as Lots A and B on a plan dated September 1952 and recorded in Plan Book 106, Page 31 (Exhibit 1). Said lots are hereinafter referred to as "Residence Lot" and "Boatyard" respectively.
. . . the right, which right shall be appurtenant to and run with the land, to use that portion of the common driveway located on Lot B as shown on said plan for all purposes for which driveways are commonly used in said Falmouth. 3. The "common driveway" referred to in the above referenced deed runs from Falmouth Heights Road on both sides of the line dividing the Residence Lot and the Boatyard for a distance of 146 feet to a wall as shown on the plan. 4. Barnard, in October 1966, conveyed the Boatyard to Falmouth Marine Railways, Inc., which on June 15, 1981, by deed recorded in Book 3305, Page 196 conveyed the property to Fred P. Wormelle individually, predecessor in title to the plaintiff. 5. In August 1973, John J. Kennedy, successor in title to Mansfield, recorded a plan in Plan Book 274, Page 38 (Exhibit 13) showing a division of the Residence Lot into three lots designated as A, B and C. This plan specifically outlines the common driveway along the northeasterly boundary of the Kennedy property and that of the plaintiff. The plan further extends it from the boundary across the southwesterly ("Wharf") area of the Boatyard to newly designated parcel C. The extended driveway bears the legend "Permanent easement to parcel C."
A composit plan from Exhibits 1 and 13 is attached hereto showing parcel C, the Wharf area of the Boatyard, the common drive and the Residence Lot. There is no record grant of any easement in favor of the defendants over the Wharf area of the Boatyard. While it is difficult to scale a reduced plan, it would appear that the driveway between the wall and the carpenter shop was about eight feet in width and that the area leading from the common drive to the Wharf area was less than five feet in width. Mr. Barnard testified that the driveway ended at the slip and it was extremely difficult to turn a vehicle onto the Wharf area of the Boatyard. Undoubtedly, this was the reason for the 18 foot triangular easement over the Residence Lot. The defendants have suggested an easement by necessity or prescription but have offered no evidence to establish either. The defendants carry the burden of proving the existence, nature and extent of any easement. Foley v. McGonigle, 3 Mass. App. Ct. 746 (1975); Krinsky v. Hoffman, 326 Mass. 683 (1951). At the time of the Mansfield conveyance, the Residence Lot, which then included parcel C, had ample frontage on Falmouth Heights Road. There was testimony of a change in grade between Lots C and A (as shown on the 1973 plan), however, there was no evidence that such change in grade rendered access so difficult as to support an easement by necessity. There was no testimony as to adverse use, the only evidence introduced showed that at least until 1966, any use of the Wharf area made by the defendants' predecessors was done with permission of the Boatyard owner. Use thereafter is immaterial as this suit was brought in 1982 tolling the statutory period. 1. None of the defendants named in the original complaint herein have an easement in or over the southwesterly or Wharf area of the plaintiffs' property. 2. 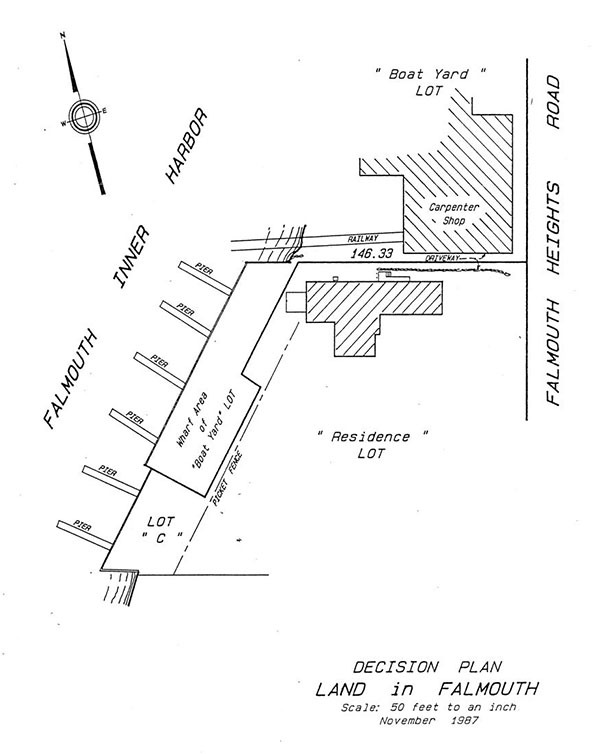 The defendants are permanently enjoined from the use of any area of original Lot B, on said 1952 plan with the exception of the driveway running from Falmouth Heights Road approximately 146 feet to a wall as shown on said plan, and any area as may be permitted by the plaintiffs or such areas as may be open to the public. [Note 1] All recorded instruments referred to herein are at this registry.